Enjoy your stay in the wonderful City of Prague in a very quiet garden district just at the Prague Castle. We offer an accommodation in a very big apartment in our family house. This apartment has a separate entrance and it consists of a hall, 2 very big double rooms +extra beds, a bathroom (with bathtub) and a kitchen on the first floor. Additionally you can book the third bedroom like a smaller Apartment with kitchenette, as well as a shower and WC on the second floor. All bedrooms are very spacious (we can put an extra bed there) and they face South. In the total we can accommodate up to 9 persons in 3 bedrooms. We offer also safe parking and WiFi for free for you. Baby cot and baby chair available for free. There is an excellent connection by tram no.22 - the best one for tourist in Prague brings you to all the most important sightseeing (runs every 5 min. )- to the City (10 min.). Tickets for the public transport are cheap and available in our house. There is also a direct public bus191 transport to the Prague airport from here. Supermarkets and some very good restaurants you can find in a very short walking distance. Enjoy our hospitality: We are a young family speaking English, German, Italian, French and Czech and offering our apartments for a long time. We love Prague and would like to do the best for your enjoying of this wonderful City. Excellent location - central and quiet with the sightseeing tram22 - the next stop behind the corner. Safe parking for free. Supermarkets and restaurants in a walking distance - everything available! Thank you for your very nice words. We are really happy you´ve enjoyed your stay in our apartment. See you next time! Michal, the owner, is the perfect host. It´s a great pleasure for us you´ve enjoyed your stay in our apartment and you were very happy there. We try to arrange our apartment so enjoyable as possible also with the flowers at the window, that must be watered regulary and naturally not only you like guests but also the owner has the key and access to this apartment. According to your description you already know how did it happen with the plastic bottle for watering of flowers. We absolutely loved our stay in this apartment! We are a family of 5 (kids ages are 7, 5 and 3) and after two months of experiencing apartments of various sizes throughout Europe, we were immediately impressed by the roominess and homeliness of the apt. It was such a relief to have a bit of space for the family and everything we needed. I might also add that the cleanliness was excellent. Michal's efforts were outstanding. His generosity in meeting us at the train station, orientating, organising, leading and informing us right at the beginning was key to a very enjoyable experience of Prague. One of our objectives for travel was to provide our children with authentic experiences in the places that we visited. In Michal's apartment, we were able to live like a Czech family for 9 days and experience genuine Czech hospitality. We were very blessed by Michal and his family's efforts. While the apartment is in Michal's home, I can heartily affirm that it is very private indeed. In fact, we felt very secure. Also, while the accommodation is not in the city centre, it is easily accessible by the #22 tram (which sure beats any hop on hop off tourist bus! Don't waste your money in that!). So, if you're happy not to be walking distance for the major sites, then this apartment would be a great option for you. There is a little incline on the walk from the tram stop to home, but we saw this only as a good opportunity to burn off all the Czech food we had been eating! A beautiful Czech family, hosting a homely apartment in a safe and quiet suburb just out of the city. A taste of the real Prague! We were two couples using this property. My husband and I used the top floor appartment and our friends used the apartment below with the full kitchen. Michal was MORE than helpful and kind when we each arrived at different times. He gave us brochures, maps and recommended places to see and places to eat. This property is a bit out from the main areas, however, the tram was SOOO easy to use. Michal even had tickets that we could purchase from him making our first adventure out very easy. Billa grocery store is about a 10 minute walk so all the things we needed were easily gotten. We would highly recommend this property to people who like the B&B atmosphere. Great, we love it to give our best for our guests staying in this very spacious apartment just in the Heart of the Middle Europe - in the Golden City Prague. Welcome to see you again! My husband, myself and our college-aged daughter stayed in the two bedroom apartment for a week while visiting Prague. Michal, the owner, met us on arrival and oriented us to the city and the public transit system. He had pamphlets for various sites in Prague and had researched event times for activities in the city the week of our stay. Overall, he was quite helpful and accommodating. The apartment itself was pleasantly spacious and comfortable. It is, as other reviews have mentioned, about 2 blocks from the tram line. It is on a small incline, and probably not well-suited to people with physical limitations. The #22 tram takes you from the neighborhood in Brevnov to the older, touristy part of Prague in about 10-30 minutes (depends on where you are headed - Prague Castle is quite close). It was great to get familiar with the tram and metro - we went to many sections of Prague during the week and traveled easily on public transit. A 24-hour pass for all transit lines costs 110 korunas (about $5). #22 is a great line, because it travels to many interesting parts of the city. Brevnov itself has the Brevnov Monastery. There is a view of it from the apartment. We had a very good Czech meal in the tavern there our first night in Prague. If you do stay here and are traveling on Tram22, do jump off the tram at Marjanka and walk toward the city to Moje Kredenc (Belohorska 26) for hot chocolate. It was a delicious way to start the day. We saw many beautiful sights, but would recommend taking the audio tour through Lobkowicz Palace and catching a classical music performance at St. George's Basilica at Prague Castle. Also, be sure to see the Astronomical Clock chime on the hour and hang out in Staromestske namesti one evening to watch the street performers. Overall, this was a great place to stay and I would not hesitate to recommend it to a friend or to come back. I gave it 5 stars for value: it is a clean, quiet, comfortable place and well worth the price. It is convenient to the city (the tram runs frequently and is available all night, although less frequent after maybe 11 or midnight), but we never planned to return to the apartment until we were done sightseeing for the day since it does take some time to get back and forth. Then we would take advantage of the cozy kitchen to have a glass of wine or cup of tea and plan our adventure for the next day! 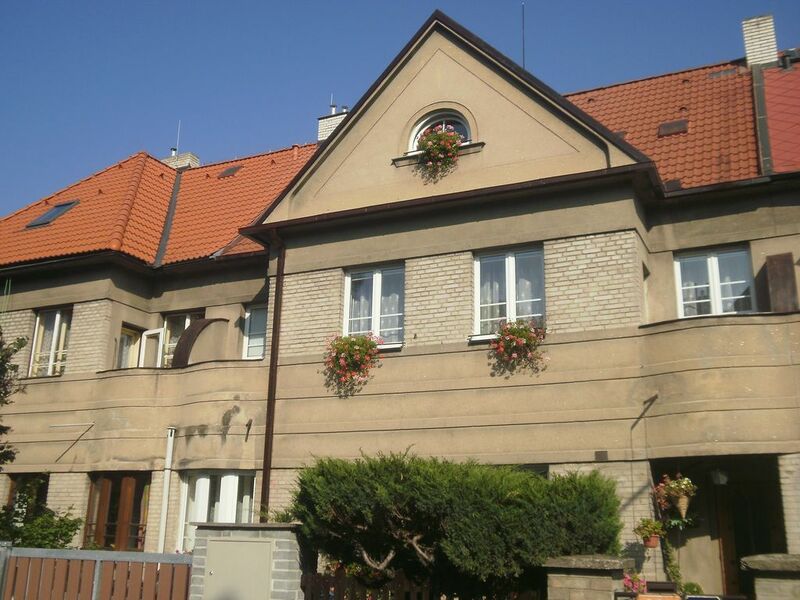 The vacation villa is situated in a quiet garden district called Brevnov, westward of the Prague Castle. There is a very good connection by tram No. 22 to the city (5 minutes) and a direct public bus transport to the international airport (15 minutes).